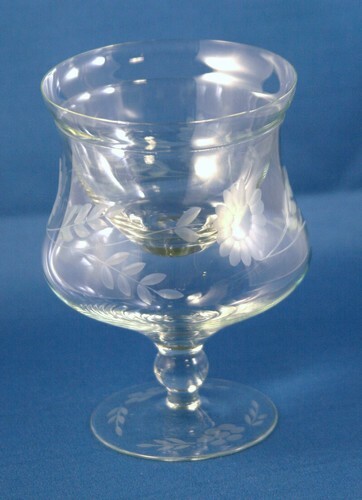 Etched shrimp cocktail glass with glass insert. The decoration is flowers and leaves on the bowl and on the foot. Crushed ice goes inside the bowl and shrimp, crab, fruit, or any other "cocktail" mixture are served in the insert. It measures about 5 1/4 inches high by 3 1/2 inches across top. Condition is excellent. One flea bite on one inset.